How would you like the surprise when you realize your cozy hotel suite is made of paper? And what do you say when your Hong Kong host aunty Lucy writes to invite you back to visit the tree you planted years ago and eat its fruits? And on your next visit to Amsterdam you could make your own Gouda cheese – six months later it would be sent to your home – complete with a memorable label. These and others are fresh ideas for the hospitality branch students have come up with during an international design workshop this summer. 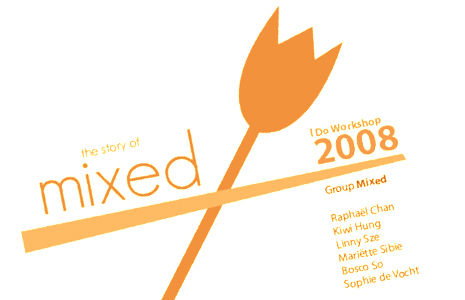 Organized by School of Design, The Hong Kong Polytechnic University, “I.do 2008” took place in Hong Kong, Shenzhen and the Netherlands. “I.do” (the international design opportunity) was created as an innovative design workshop by PolyU Design four years ago. Theme of I.do 2008 was Hospitality and the impacts of changing demographics on designing. Apart from PolyU Design and TU Delft’s IO Faculty, the European partner, four other renowned institutions were invited to participate. They are: the School of Hotel and Tourism Management of HK PolyU, Hong Kong Design Institute; from The Netherlands the Design Academy Eindhoven and the Hotel Management School in Maastricht. The six institutions sent four students each and staff to participate. The international faculty from different design disciplines and from Hotel and Tourism Management work with the multi disciplinary and multi cultural student teams. Renowned experts from hotel management, service design and architecture contributed. Working with students from other design fields and disciplines opened up ways to learn different methods, understand different standpoints and learn about different processes. To conduct the workshop in the two countries where the students came from was the best driver for actually gaining in-depth understanding and developing new ways of seeing and communicating. That they had to go to others’ places and cook food together, share skills and knowledge was perceived as invaluable. This group was conscious about their differences from the beginning and was probably the most outspoken about their internal difficulties during the process. The differences of design disciplines, ways of working, and expectations of outcomes led to many discussions, frustration and to compromises in the end when discussion would not work. This group became a most productive team. With “Room Customization” guests can change the room interiors to their own preferences. Decoration materials are found in the corridors and the common room. At the “Common Room” all guests can gather and spend time. In this common room, there is always somebody to talk to, other guests or staff. Special features like an “Advise Me Map”, diverse workshops to stimulate interaction in a different way, and a dining area with large tables instead of many small ones are in place. “New Money System” Upon reservation, guest can exchange their skills, services or products for a stay in the hotel. There is no money involved and it’s a win-win situation. “Growing hotel” is to stimulate guests to come back to the hotel, so every time you come back to the hotel, you will get a bigger and better room but for the same price. “Leave something behind” was to create loyalty; guests are asked to plant a tree before they leave. This way, they would have something tangible to come back to.